Starbucks holiday cups emerged from hibernation on Wednesday to unleash both the coffee giant's holiday drink lineup and, potentially, some festive rancor across the internet. 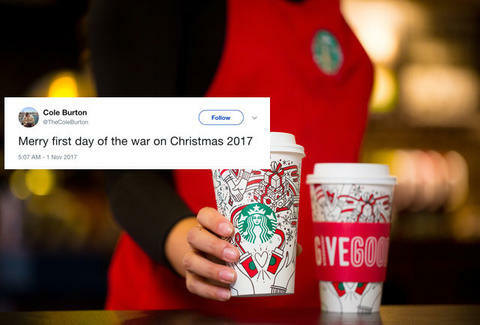 This year, the seemingly innocuous cups are mostly white and peppered with holiday-themed doodles that you can color in yourself, but that doesn't mean the company won't unwittingly provoke a "War on Christmas" -- whatever that means -- once we edge closer to the holidays. What controversy will ensue around the Starbucks holiday cups this year? Stay tuned to find out !! New Starbucks holiday cups are here. Let the ridiculous bitching begin. YES...ALL HALLOW'S EVE HAS ENDED...LET THE WAR ON CHRISTMAS COMMENCE! waiting for the new holiday starbucks cups like "i wonder who they will offend this year 😌"
Don’t mind me, I’m just over here waiting for everyone’s Starbucks outrage regarding their holiday cups. Starbucks holiday cups are out. Anxiously awaiting the world's response on the subliminal message they're trying to send through cardboard. Ahhh it's almost that wonderful time of year when we can get pissed off about Starbucks cups. You know the holiday season has officially arrived when Internet commenters start bitching about Starbucks cups and the liberal elite. People are offended about Starbucks holiday cups. Can I quit the internet? All of this commotion, and it's still early days to tell if the War on Christmas™ will actually come to fruition this year. A lot of people are still very excited that Starbucks' slate of holiday drinks are back, and so far it's mainly people mocking the specter of outrage that typically flares up during the holidays, rather than the frenzied pile-ons we've seen in the past. In any case, it's never too late to drown yourself in a peppermint mocha and pull up a chair to watch the ensuing drama unfold. Happy holidays!